« Jobs says Flash isn't good enough for iPhone. Why announce that now? Let’s run down the Wish List from Apple’s iPhone Software Roadmap shindig today at the Cupertino HQ. The availability of an iPhone Software Developer Kit (SDK). Check. This SDK will allow for development of third-party applications for the iPhone. Check. Apple announces corporate, enterprise support for the iPhone. Check. This means push email. Check. And use of corporate calendars and contacts. And IT security features for the corporate Nervous Nellies. Check. And there’s a way of distributing applications that doesn’t rely solely on tethering the iPhone to a computer to access the iTunes Store, where apps can be purchased and downloaded. Check. And there’s an instant message client. Check. And games that take advantage of the iPhone’s unique physical features, including a touch screen and accelerometer. Check. About the only thing that hasn’t been checked off the wish list is immediate availability. We’ll have to wait until late June for the final iPhone SDK and the resulting third-party applications and enterprise support. We’ll see about that come late June, the first anniversary of the iPhone. But on paper at least, Apple is satisfying nearly every major wish expressed by developers, consumers, corporate users, and IT folks with the imminent release of the iPhone 2.0 software platform. Now that the noise has died down, we take a look (in no particular order) at what happened today in the iPhoneosphere and its significance. With the SDK Apple has provided third-party developers with everything they need to produce compelling applications — access to the Multi-Touch user interface, animation technology, storage, built-in three-axis accelerometer, geographical location technology, view hierarchy, alerts, Web view, people picker, image picker, and camera, among others. A beta download of the “Cocoa Touch” SDK is available now, it’s free, but the final release will not happen until the end of June. If a developer wants an application distributed, a fee of $99 must be paid to join the iPhone Developer Programme (TUAW). Windows developers, however, must use a Mac to program — and an Intel Mac to boot. Significance: big-big time. 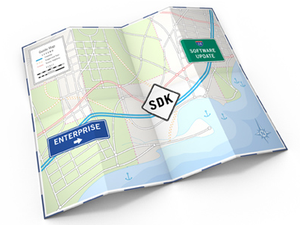 The SDK is where the new third-party app magic begins. Apple removed all roadblocks to large-scale corporate purchasing and deployment of iPhones by adding full Exchange support, including Microsoft ActiveSync, remote wipe (for the device if it is lost or stolen), Cisco IPsec VPN, WPA2, and other enterprise features. What all this enterprise gibberish means is that push email (perhaps the No. 1 feature for BlackBerry users) and calendar and contact management will be available on the iPhone. With ActiveSync, email is “pushed” to the iPhone as soon as it is received, rather than waiting on a schedule like every 15 minutes to download new messages. By licensing the ActiveSync protocol from Microsoft, Apple will enable the iPhone to talk directly with corporate Exchange servers. It will not need the inclusion of a “middleman” server like the BlackBerry, which has suffered from recent outages and ticked off customers in the process. Nokia, Sony Ericsson, and Motorola also license ActiveSync. “This takes the iPhone from being not really in the running in the enterprise to being very much in the running and gives RIM (Research in Motion) a serious challenge,” Van Baker, an analyst with market research firm Gartner, told Reuters. Significance: big time. This move bolsters the iPhone’s enterprise credentials, although it’s not a given that Apple will overtake Research In Motion’s BlackBerry line of products in the corporate world. iPhone users will be able to browse, purchase and install applications on their phones directly from the new App Store, no computer interface required. 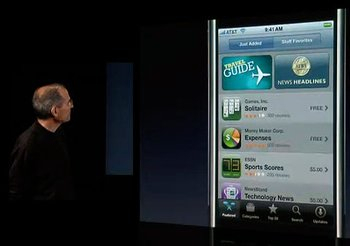 The App Store will become available on the iPhone with the next software update. The App Store reminds us of the iTunes WiFi Store. Users will browse applications by most popular, featured items, categories, top lists, or search. Apps can be purchased and downloaded over WiFi, the EDGE cell network, or though iTunes using a computer. One nice feature is that the App Store will let you know when an update for an installed application is available; one click starts the download and installation process. Another nicety for developers, Apple will let them set the price. They keep 70 percent of the revenue, with Apple paying out on a monthly basis. The 30 percent slice includes infrastructure and credit card fees. Developers can also provide free applications, which Apple will distribute at no charge. There is a $99 setup fee at the App Store. “This is the best deal going to distribute applications in the mobile space,” Jobs said. Significance: big time for the user; big-big time for the developer. While the SDK will not be released in its final form until June, a few developers gave iPhone users an early glimpse of what to expect from native applications. One app everybody has clamored for since Day One has been an instant message client. Apple has chosen AOL’s popular AIM client (no surprise) for use on the iPhone. 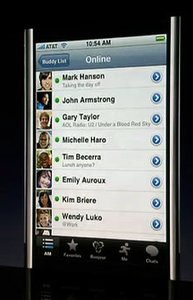 iPhone AIM will allow users to set their chat status; iPhone photos can be used as buddy icons. The Buddy List integrates with Address Book and iPhone’s contact list, displaying name, status, and icon for each buddy. iPhone AIM also supports multiple simultaneous chats. Switching between chats requires, naturally, a “swipe” across the touch screen. Significance: depends on your desire to chat — big time for those who love to chat with buddies using AIM, welcomed by those who chat periodically using AIM, and zero for those who prefer other chat services like Yahoo or Google (you can expect third-party developers, however, to take care of these). 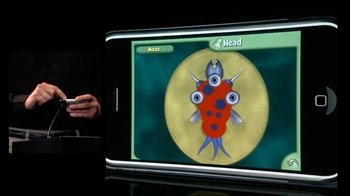 Electronic Arts demonstrated a game based on Spore, expected to be released on Macs later this year. It takes advantage of the iPhone’s touch screen, accelerometer (used to control movement), video and audio capabilities. Game play is based solely on tilting and maneuvering the orientation of the handset. SEGA introduced its game, Super Monkey Ball, that also leverages the iPhone’s accelerometer. To move the monkey around the screen, simply tilt the iPhone. “It’s gonna be really hard to go back to a traditional game controller,” SEGA’s Ethan Einhorn said. 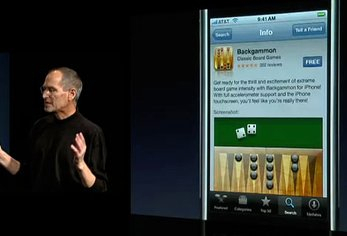 Apple also showed a game developed, like the others, in two weeks. “Touch Fighter” is a space-based shooter that you steer by tilting and aim by pointing the device. Significance: big time — and possibly big-big time, depending on execution. Using the accelerometer could introduce games unseen in the mobile gaming market to date. 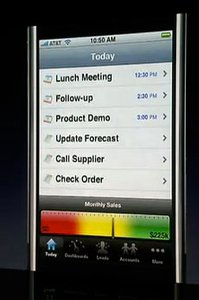 Salesforce.com showed a sales tool app that will allow representatives to see graphical views of their monthly goals on the iPhone. Epocrates demonstrated an application allowing doctors to look up drug information. Touch FX adds Photo Booth-style to photos on the iPhone using the touch screen. Significance: to those of us who don’t use Salesforce.com or are not doctors, nada, zip, zero. Overall, it’s big-time because it gives us a glimpse of what we as iPhone users can look forward to. Venture capitalist firm Kleiner Perkins Caufield & Byers is making $100 million available to entrepreneurs looking to start businesses based on the iPhone and iPod touch. The money is placed into a collective pool known as the iFund. It’s expected that most of the funds will go to developing location-based services, mobile commerce, social networks, and communication and entertainment add-ons. Significance: big-time, depending on how it’s administered. If startup money gets into the right hands, development for the iPhone will be assured — which is important, considering Google is offering support money to developers of its mobile operating system Android. We’re a little disappointed we won’t see real applications for the iPhone until the end of June, but, hey, we’ve waited this long. What’s a few more months when most of our wishes can be checked off the list? What about 3G support? That is what I really want! Still not a business tool.